St. Thomas Church of Cansaulim. Cansaulim Church is commonly known as the St. Thomas Church of Cansaulim. 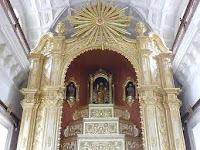 This church was built in 1581, near the coastline of Goa. It has been constructed according to Portuguese architectural style and was renovated in 1632. This church is currently maintained by the Archaeological Survey of India (ASI) and finds a place in the UNESCO World Heritage List. The present structure of the church is a fusion of Portuguese Manueline, Turkish Baroque and Italian Mannerism architectural styles. This church is easily accessible from the main village by local buses, taxis and motorbikes.